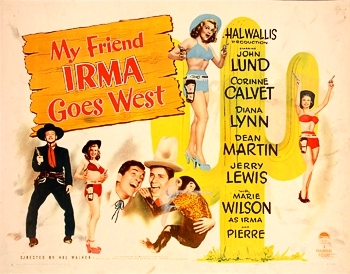 I’LL ALWAYS LOVE YOU was featured in the 1950 film My Friend Irma Goes West. Based on the radio show My Friend Irma and featuring the comedy team of Martin and Lewis (Dean Martin and Jerry Lewis), this sequel to My Friend Irma (1949) was released May 31, 1950 by Paramount Pictures. The plot revolves around singer Steve (Dean Martin), friend Seymour (Jerry Lewis) and fiance Jane (Diana Lynn), along with her dizzy blonde room mate Irma (Marie Wilson), as they experience a series of misadventures on a California-bound train and end up involved with a gang of murderous gangsters in Las Vegas. Dean Martin, All The Hits 1948-1969, MCPS DBP 102005. Dinah Shore, The Great American Composers-Jay Livingston & Ray Evans, Columbia House 2CD2 8651 / C21 8651.